After a beautiful Memorial Day weekend, summer is finally here, bringing more long days at the beach and warm evenings walks in the park, it also brings wedding season. 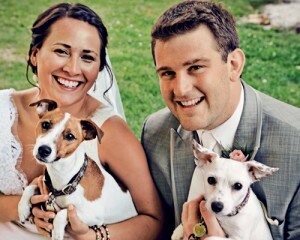 Coordinating trip plans for all of your summer weddings can get hectic, make sure your pets don’t feel the wrath while you’re away for your loved one’s nuptials. When traveling, it is always strongly encouraged to keep pets at home, as kennels can be stressful for animals. If you’re having a sitter stay with your little guys while you’re away, it is wise to pet-proof your home before you leave. Common household pet emergencies can include, accidental ingestion of medication, fractures, and intestinal blockages, all of which can happen when a pet is left alone or even when being watched. Before you travel to your wedding destination, check the safety of the home from the pet’s point of view to remedy any potential dangers. A helpful rule to keep in mind is if your pet can jump, crawl, or leap to it, it’s within their reach. Lookout for sharp corners that should be covered, and small spaces where a curious cat or puppy can get into and block them off. Dogs will sometimes chew on electrical cords, risking electrocution, so keep cords out of reach whenever possible. Kids toys and knick-knacks are choking hazards and should be kept out of your pet’s reach. Check household plants and foods within the pets’ reach to make sure they aren’t harmful. Along with chocolate and chicken bones; grapes, onions, and macadamia nuts can be very harmful to animals. Upon returning from a wedding, you may bring flowers from the reception to brighten your home. Beautiful flowers and even some common houseplants pose a threat to pets. Lilies, tulips, and irises are very harmful if ingested by some animals, especially cats. Fortunately, most houseplants are safe, but be sure to review the list common toxic plants at the American Society for the Prevention of Cruelty to Animals. Even if a plant isn’t toxic, many plants are irritants and can trigger sickness in house-pets. Keep these tips in mind when you’re planning your wedding getaways this season. Having peace-of-mind that your pets are safe while you’re away will ensure optimum relaxation and fun for the summer of weddings ahead.